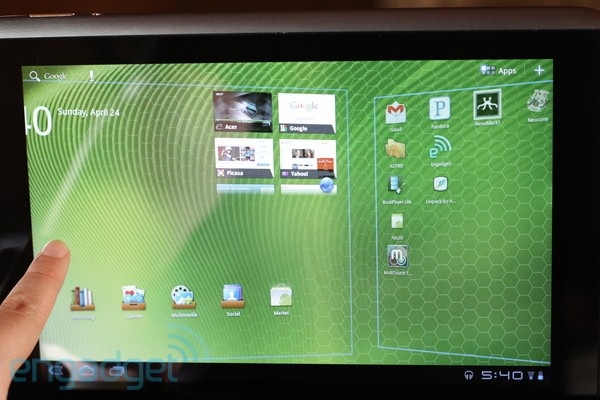 "Last month, the Motorola Xoom was the only officially sanctioned Android 3.0 tablet available in the United States. Now there are four -- the T-Mobile G-Slate arrived last week, the Acer Iconia Tab A500 this week, and the ASUS Eee Pad Transformer is on sale today, assuming you can find one. All have the same basic silicon inside, but oh-so-slightly different approaches to shape, such that price might honestly be the deciding factor these days. That's where we thought this WiFi-only Acer Iconia Tab had an edge, launching at $450, but now that ASUS has shaken the money tree with a $400 figure for the Eee Pad Transformer, we doubt other price tags will stick." Some pluses, some minuses, for this new Honeycomb tablet, but, overall, Engadget's opinion is that it's got a good LCD and speakers, a speedy processor (faster than the Xoom in most tests), and has functional USB for attaching a keyboard (mouse not working yet). Minuses are very mediocre battery life, cameras are very average at best, and very little additional software is available over and above what is offered by Acer, and very little is superior to the native Android apps. Also build quality seems a bit suspect, with exposed (hair-pulling) seams, and too much plastic. Bottom line is that there is not much here to make it a must-have. Price is a bit lower than the iPad 2, but, even so, this doesn't look like a serious competitor, at least in this first iteration.